Image: Vector Illustration/Shutterstock. Navin Penrat/Shutterstock. Design: Ashley Britton/SheKnows. Sifting through the best high chairs on the market can be as challenging as convincing your picky baby to gobble up all of her pureed spinach. But, just as introducing leafy greens into a baby’s diet is vital for her growth, finding the right high chair is critical for childhood development, says early childhood specialist Janice M. Robinson-Celeste. Finding the right high chair can also help make family dinnertime fun and enjoyable for parents and babies, as it helps create a sense of togetherness — according to registered dietician nutritionist, child feeding specialist, and lactation consultant Crystal Karges of Crystal Karges Nutrition. Mealtimes can be stressful enough, especially if your child is a picky eater or hungry all the time. 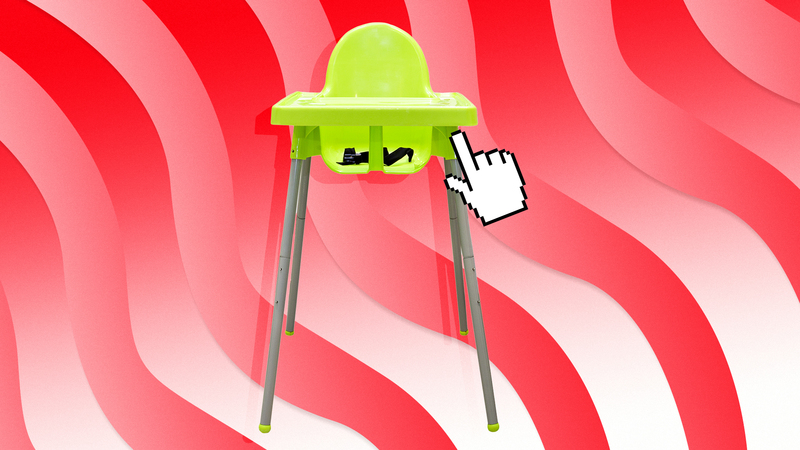 So how can parents know what to look for in a high chair to improve their child’s experience? Both Robinson-Celeste and Karges recommend looking for chairs with adjustable footrests and wide, removable trays. Below, we’ve listed some of the best and safest high chairs available — to help you spend less time shopping and more time bonding with your little one. The Italians are known for making beautiful products, right? Leather, luxury cars, glass and, yes, even high chairs. The Peg Pérego Siesta is a high-end high chair designed with style and function in mind. Not only does this high chair roll; it also has five reclining positions and nine height adjustment options to maximize child comfort. Because tiny hands can make huge messes, the Siesta comes with a dishwasher-safe tray liner and stain-resistant upholstery. That’s amoré. Fact: Kids grow out of everything eventually. But that doesn’t mean you can’t slow that process down a bit. The Blossom 6-in-1 chair was designed to expand with kids from infancy to early youth with kids’ safety and comfort — and parents’ wallets — in mind. The chair features six adjustable heights and promises to easily convert from an infant high chair into a booster seat and a kids’ chair. Since the booster seat comes separately, parents can comfortably accommodate two children at different stages. Plus, the Amazon reviews are full of parents raving about how easy it is to clean (thanks to removable trays and washable seating) and wheel around. If you’ve ever looked at the cost of a high chair and said, “That chair better grow with my kid into adulthood,” look no further than the Abiie Beyond. This midcentury-modern-inspired wooden high chair, made from sustainable European beech wood and designed in Austin, TX, transforms into a dining chair that kids and adults of all ages (up to 250 pounds) can use. The cushions are removable, stain-resistant, and hand-washable and come in a variety of colors (olive green, blueberry, raspberry, cream, and black). Parents and caregivers can remove the tray and plastic tray liner for quick cleanups. Like the Abiie, the Stokke Tripp Trapp chair was designed for years of use by children and adults (up to 242 pounds). The high chair, which comes in a variety of fun colors, comes with a baby set that includes a seat and a five-point harness for children six months to three years old. Additionally, the seat and footrest are easy to adjust depending on your needs. Parents will, however, need to purchase the Tripp Trapp adjustable plastic tray and cushions separately. The Inglesina Fast Table High Chair is an excellent option for parents who either don’t have space for a traditional high chair or who just want something easy to travel with. In addition to a travel bag and storage pocket, the chair comes with twist-tight couplings that screw onto tables up to 3.5 inches thick — and it seats babies and tots up to 37 pounds. Though the most exciting feature may be the removable, washable cover for cleaning those inevitable food messes. The Fisher-Price SpaceSaver is a fantastic option for parents who want a portable high chair alternative but are wary of models that clip onto the table. This chair looks more like a booster and comes with straps that quickly, yet sturdily, connect to the back of most dining chairs. Let’s face it: Not everyone has space (or the desire) to have a high chair out in the open at all times. Weighing in at 15 pounds, the Nook is simple to fold and transport without requiring a lot of time or strength. It’s also painless to clean thanks to its dishwasher-safe tray and wipeable cushions. Plus, you can plan on getting a lot of use out of the Nook since it accommodates kids up to 50 pounds.